In this study, Kimberly A. Truong and Samuel D. Museus focus on understanding strategies doctoral students of color use to respond to racism. 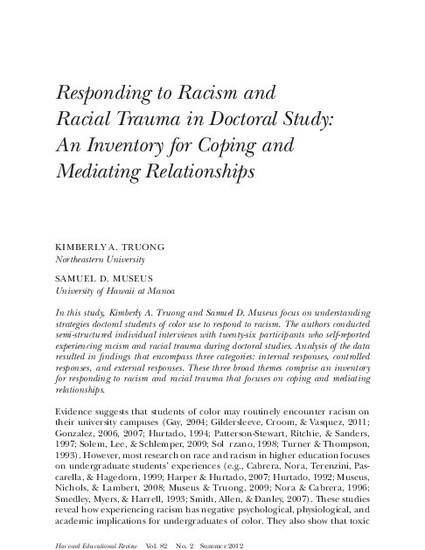 The authors conducted semi-structured individual interviews with twenty-six participants who self-reported experiencing racism and racial trauma during doctoral studies. Analysis of the data resulted in findings that encompass three categories: internal responses, controlled responses, and external responses. These three broad themes comprise an inventory for responding to racism and racial trauma that focuses on coping and mediating relationships.